Meet the Asian Dolce Latte. I’ve seen adverts of this a couple of times now, but since the Starbucks near my house is now CLOSED–something I still haven’t come to terms with; it was less than five minutes away from my house!! !–it was only tonight that I got to try it. I looked it up just now and discovered that it was first launched last January 31, during the opening of Starbucks’ flagship store in Ho Chi Minh, Vietnam. It’s supposed to be the equivalent of Vietnam’s trademark ca phe sua da, which is basically strong coffee mixed with condensed milk. This type of coffee is not unique to Vietnam–it’s actually quite common among Asia; hence, the “Asian” in the “Dolce Latte”. According to Starbucks, Asian Dolce Latte is “the favorite classic latte, but with an Asian twist”. 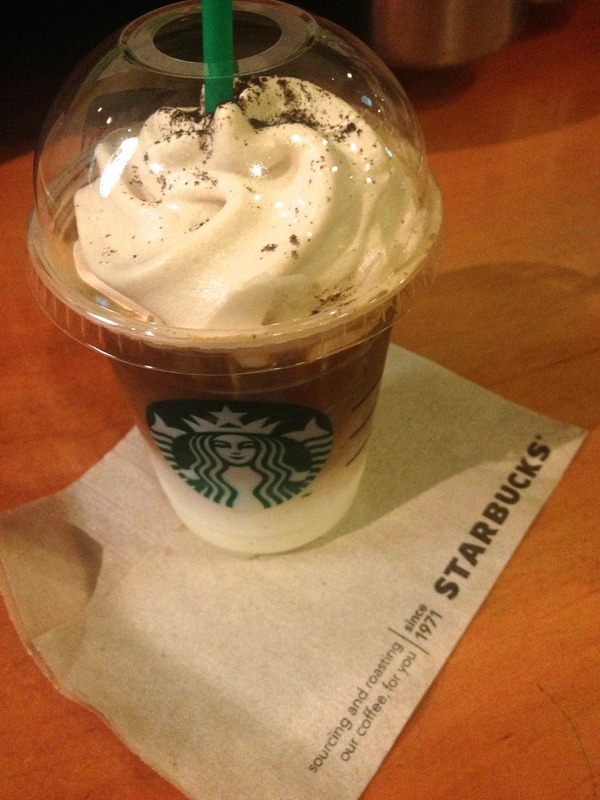 To mimic the rich texture of condensed milk, Starbucks concocted a special dolce sauce made of several kinds of milk. And to provide that extra kick associated with the cafe sua da, they added an extra shot of espresso (at least, to the tall-sized drink). Before I ordered the drink, the barista told me that it was sweet like white chocolate mocha, but looked like a caramel macchiato. Those are two of my standard Starbucks orders, so I was game to give it a try. When I got the drink, I thought, yeah it did look like an iced caramel macchiato, with its marked layers, but with the addition of whip. The whip’s espresso-flavored, by the way–something that also piqued my interest. First impression of my first sip: mmm. It was really good. I don’t even know how to describe it. The barista told me they used non-fat milk as a standard for that particular beverage, but it definitely didn’t taste like any non-fat milk I’ve tried. It was rich, creamy and smooth on my tongue, and it had a certain taste to it that I still can’t identify. Second sip: mmmm mmm mm. If I could draw a cartoon of how I felt then, I would draw a girl with stars in her wide eyes. Yep, I was all kinds of starstruck. And since I’m a fan of all things creamy, I had to taste the whip on its own. In my opinion, Starbucks uses the best whipped cream in the coffee world. I expected great things from the espresso whip and…it fell short of my expectations. I don’t know if they use the same whip as J.Co does in their Jcoccino Frappe (one of my mega-late coffee blogs), but it wasn’t really memorable on its own. For the final step, I mixed everything up to see how it all meshed together. Sadly, the unique flavor of the dolce syrup was masked by the espresso, rendering it almost similar to a macchiato. I wouldn’t have guessed that it was supposed to be inspired by iced coffee and condensed milk that I grew to love in Singapore. Still, it was definitely worth a shot. Maybe I’ll try it again, but without mixing the layers. Anyway, I’m hoping the double shot of espresso will power me through my article writing. //Asian Dolce Latte is only available in Starbucks Asia Pacific stores, supposedly until April 22. Hey… i do agree with what u wrote between the taste of caramel machiato and asian dolce latte. But overall somehow for me asian dolce latte winds for its rich falv as u said! So how about u? So sorry for the late reply, Fina! I love the Asian Dolce Latte too—in fact, I miss it so much since it’s not available in the Philippines anymore. 😦 Thanks for dropping by!